Enjoy the complex yet simplistic fusion of Caribbean cuisine with Washington’s premier restaurant 876 Cafe. 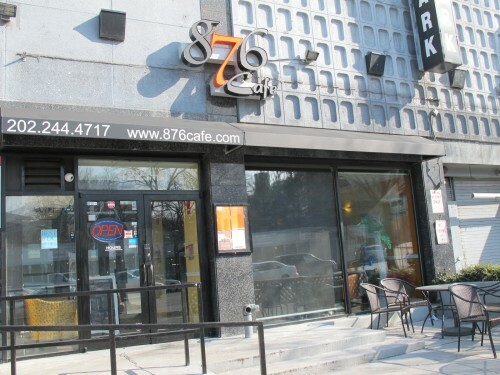 Located one block from the Van Ness metro station neighboring the Cleveland Park area, 876 Cafe invites you to experience familiar dishes piqued with zesty accents of the islands. Inside, the warm and open decor showcases talent of local artists and helps the customer to transcend to a vibe where everything is “irie and cool”. Sample favorites like our fresh multi-green salad infused with sweet coconut-gingered flakes, ackee and saltfish wraps or our refreshing coconut water contained in the original husk. And as with everything you can expect exceptional service in a casual environment. Go ahead. Grab a group of your friends or co-workers and relax on the veranda, bar or swanky WiFi lounge area for lunch, dinner, weekend brunch or happy hour. 876 Cafe promises to stimulate your pallet and captivate your senses.